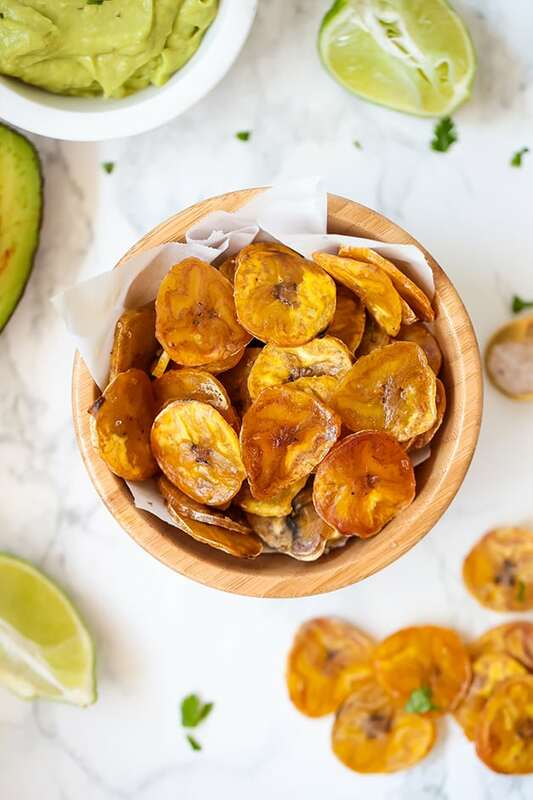 These homemade baked plantain chips are crunchy, salty, and delicious! This recipe is a healthy, paleo, AIP snack that’s so simple to make at home. I had never eaten plantain chips until I went paleo. I don’t think that I even knew what they were! Little did I know how huge of a staple they were in Latin American culture, and how delicious they are. They’re the perfect swap for potato chips, and are arguably even more delicious. There are so many amazing options for store-bought plantain chips, but I love having the option to make them homemade as well. Not only does it help control the ingredients you add, but it also makes portion control easier. First, what are plantains? Where do you get them? Plantains can be loosely explained as starchier bananas. They look the same, but act more like a root vegetable. That’s what makes them perfect for chips! Green plantains are what we’re using for chips as these are starchier. As plantains turn yellow and eventually, they become sweeter and softer which isn’t as ideal for chips. Plantains are often available at health food stores like Sprouts or Whole Foods, and I often buy mine at Fiesta. Every area is different, so you have to shop around a bit! Green plantains are less sweet and more starchy which makes them better for making chips. You can find these at tons of different stores! Avocado oil has a high smoke point and really enhances the overall flavor. Just a little bit of fresh lime juice really takes these to the next level! Using guacamole or something like this avocado cilantro lime sauce on the side rounds out the whole dish. Technically, you can just slice the plantains with a knife. However, not only is it harder to do, but you don’t get even slices which makes the chips bake unevenly. 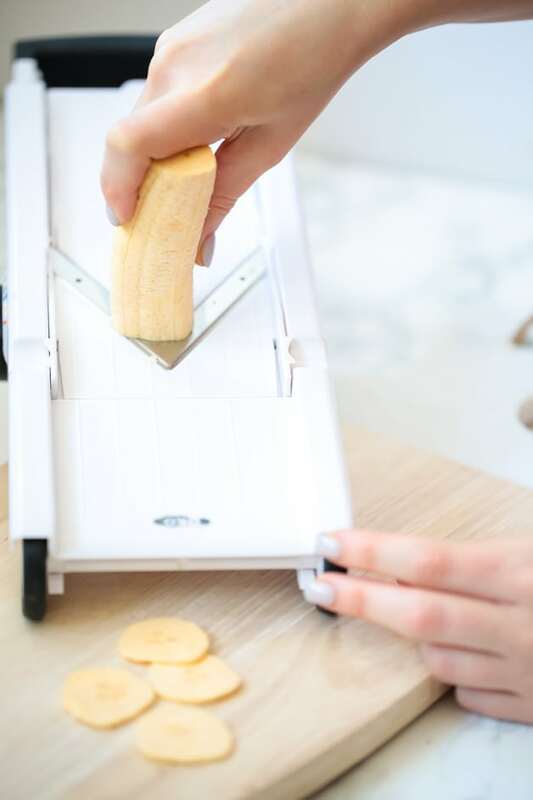 A mandolin slicer set on a low setting (1/8″) is the best option to get even, thin, and crispy plantain chips. You do have to be careful to make sure you don’t cut yourself, but a plantain is much easier to use on a mandolin slicer than something like a potato! 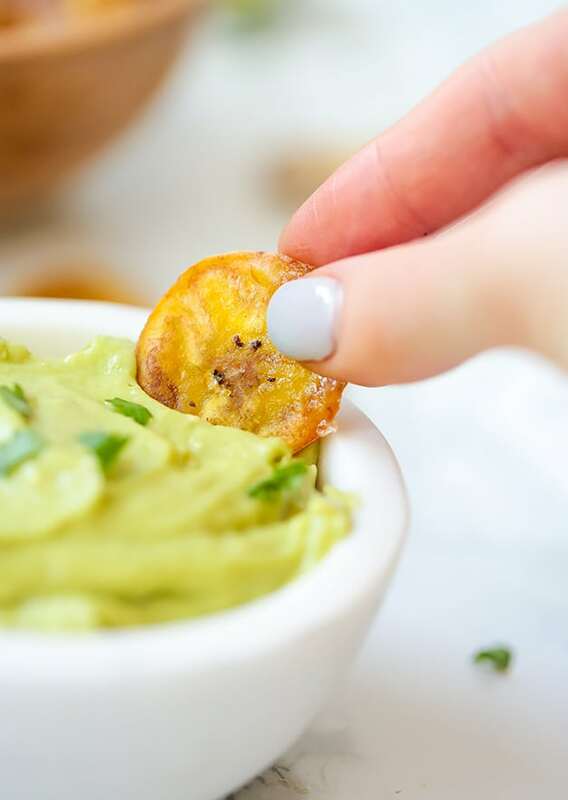 These plantain chips are the perfect homemade snack! Carefully remove the peels from the plantains by cutting off the ends, making a slice into the center of the plantain peel, and peeling it back. Using a mandolin slicer (or a sharp knife) carefully slice the plantains into 1/8″ slices. 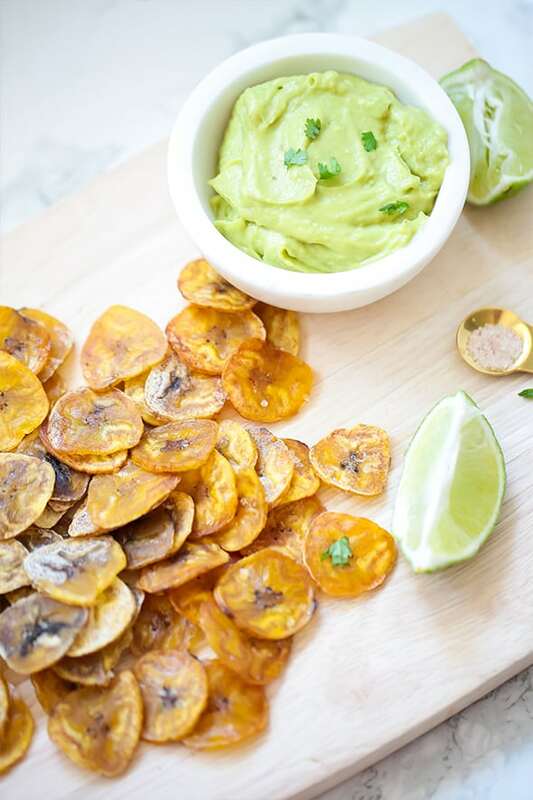 Lay the plantain slices onto the baking sheet and coat with avocado oil, salt, garlic powder, and lime juice. Bake in the oven for 15-20 minutes, or until crispy. Rotate once or twice to cook evenly. Serve with a salsa, cilantro avocado lime sauce, or guacamole.